If you want to play online bingo today, you have several leading sites out there that provide a valuable entertainment experience. Yes, even competitors of ours like 123 Bingo are a good bingo site to play at. However, if you are looking for the best bingo site on the net, we think youâ€™re going to love Bingo Mania over any other including 123 bingo online! At Bingo Mania you get a $5 free no deposit bingo offer plus a $70 free welcome bonus. There are many sites out there like 123bingo online, but thereâ€™s only one site like Bingo Mania, one of the longest running bingo site and the #1 voted bingo site by Which Bingo players in 2010. We feel bingo players looking to play bingo games, will have a better experience at Bingo Mania then 123onlinebingo.com for several key reasons which we will breakdown for you here. Sure, 123 Bingo offers a bigger free bonus to their members BUT it comes with hidden terms and conditions that are not player friendly. At a quick glimpse you would think getting $25 free vs. $5 free is a huge advantage but hereâ€™s the catch with the 123 bingo online and most other bingo sites who offer such huge inflated no deposit bingo bonuses. Every bingo site today on the net requires their members to make an initial deposit prior to any winnings that can be cashed out. So when a site offers you a massive $25 free no deposit bingo offer, this simply means you canâ€™t withdraw any prizes you win from it because a deposit wasnâ€™t made. The advantage of the no deposit bonus is there to give you an opportunity to test-try the bingo site of your choice before making a real purchase but many sites promote their no deposit bonus as a perk which misleads players. Instead, Bingo Mania believes, to enjoy your bingo games, a generous welcome free bonus is more rewarding as you get to turn a $20 into $90 credit. Many bingo players are not aware of this and sometimes find themselves in trouble as a result. All bingo sites offer bonuses to help their members increase their playtime and enjoyment, but these bonuses seem to come with a little-hidden terms and conditions that is not always clearly stated for players. For example, here at Bingo Mania when you receive a bonus, you never need to go through any wager rule requirements to cash out your winnings. If you win on your first deposit you can cash out right away. On the flip side, at 123 bingo when you make your $50 deposit and get 300% bonus, and win a nice prize that you may want to cash out, you will first need to have gone through a 3 x wager rule on your bonus. Hereâ€™s the math: you deposit $50, you get $150 in bonus. That means youâ€™ll need to wager your $150, three times before you can cash out your prize. That means, a total of $450 has to be wagered at a site like 123 bingo where at Bingo Mania, you donâ€™t need to wager any set amount before you can cash out. offers weekly Fair nâ€™ Square Bingo tournaments where everyone receives the same number of bingo cards for a chance at huge cash prizes an opportunity for our members to unlock exclusive freeroll bingo tournaments with high paying. May I say thank you very much to everyone at bingomania.com for my jp win, nowhere else compares to mania, roomies and GMs are second to none. The win has come at an excellent time and will enjoy spending it on my holiday. Thank you so much again. I have been playing at Mania for over seven years and have been fairly lucky. BUT when I hit the coverall in the Looney Bin room for one thousand dollars I was ecstatic! I just rescued a little male doxie who was set to be euthanized and the money couldnâ€™t have come at a better time to enable me to give him what he needed, vet bills, groomer, new bed..toys..etc. My 14 years old boy who is my GL charm was watching my cards when I 25 came up and turned red. THANK YOU so much Mania for the wonderful surprise. I do truly LOVE this site. I am a Mania addict..!! 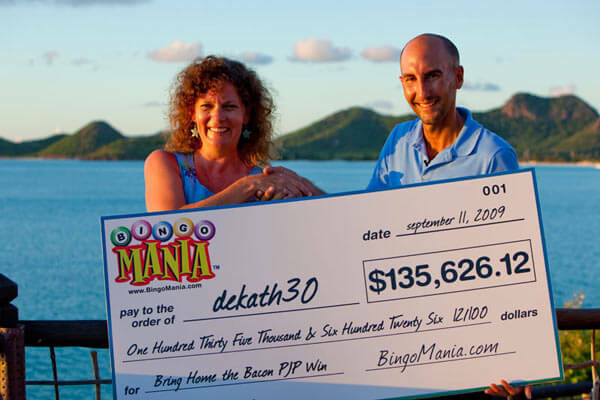 Hosting raffles online are fun and weâ€™ve done a few here at Bingo Mania as well. To ensure our raffles were done with the utmost transparency and creditability, we used the 3rd party raffle system from Random.org which the results are publicly available to every entrant who wants to verify their correct entry and results of the draw. We just hope for the good of our industry, that the folks over at 123bingo online conduct their raffles using a reputable 3rd party tool like Random.org! In conclusion, we feel 123 Bingo online is a good site with fantastic bingo specials like their daily and weekly cash raffles. However, not all bingo sites are equal. Where 123 Bingo might have an edge over Bingo Mania with their monthly cash raffles, we believe Bingo Mania offers itâ€™s members a more complete and enjoyable bingo experience because of our no silly wager rule requirements and easy deposit options.